RMS Building Services is a friendly and approachable Nottingham builder offering a variety of landscaping, bricklaying and exterior cleaning services to both residential and commercial clients. We pride ourselves on offering a professional and reliable service allowing us to deliver an exceptionally high standard of work resulting in consistently happy and satisfied customers. Given our ability to meet and exceed the needs of our clients, it’s no wonder that more than 80% of our work comes from word of mouth and recommendations from our existing customer base. 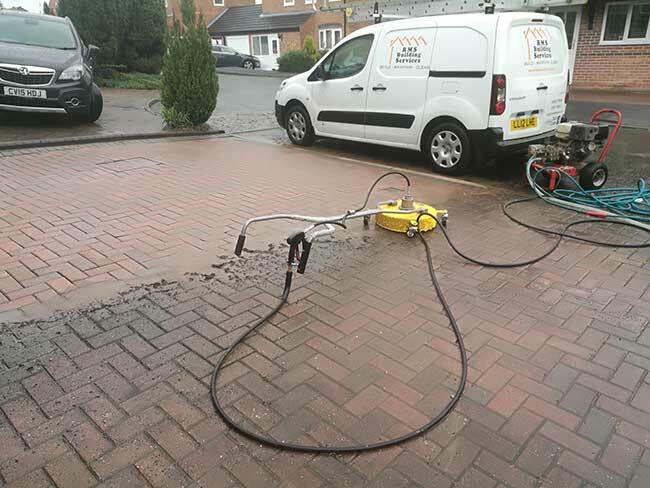 With years of experience in the building trade, if you’re looking for a Nottingham builder to help you achieve your building, landscaping or pressure cleaning needs – no matter the size, no job is too small – then simply get in contact for a free quotation. Why Choose RMS Building Services? We put a huge amount of emphasis on providing a very personal, 1 on 1 approach to each and every job we do, regardless of how big or small. We’re also fully insured and offer completely free, no obligation quotes so you can get a clear understanding of the cost of your project. But why take our word for it? Take a look at what our happy customers have to say about us! Professional & reliable. Richard & his team repaired our delapidated sandstone garden wall which now looks brand new. Would have no hesitation in using them again. Highly recommended! This is the second job that Richard has done for us,great work both times,good price and wouldn’t hesitate to recommend his services,reliable,was always there when he said he was going to be . Richard has done a number of jobs on my victorian house renovation, including repairing brickwork and repointing. He is very knowledgeable about period properties and the correct materials to use. My house is now looking so much better after some very bodged jobs by the previous owners. Richard always keeps me updated, he is reliable and really lovely to work with. We could not recommend Richard and his team enough. From the initial contact, the detailed pricing and then the job. Everything was just perfect. We were very happy to wait until they had a slot for the job, as I would never employ anyone that could start next week! The sign of a good tradesman is a waiting list. We have found a gem with RMS and will continue to use them for any building jobs. Thankyou for your efficiency and commitment to the job. Absolutely amazing guys and quality work. Had my back patio slabbed with retaining wall and it looks amazing! The guys were all so friendly and got the work done in record time and left no mess behind. Would highly recommend and would definitely use their services again. Janet and I are really pleased with the work that Richard and friends did for us in the last few days. Our patios received some well-needed restoration and the porch some excellent refurbishment. They worked hard in almost tropical heat. Their skill and conscientious attitude to their work means that we couldn’t have wished for better results. Highly recommended! We employed this firm to clean roof, block paving and drive and to lay a new patio. What a find! They rearranged their schedule to suit our needs, did an excellent job, were friendly and very helpful. They even did extra cleaning (without being asked). I can highly recommend them and would definitely use them again. Richard and Shane came to lay my patio last week and have to say what a fantastic job they have done. We are so pleased with their workmanship that we would only use these guys in the future. Im a bit OCD for straight lines and whichever way i look at it its spot on. They also jet washed cleaned and 're sanded our block paved driveway. Pleasant lads who turned up when they said they would and did a proper days work. Excellent service and definitely recommend. Highly recommended. Did a great job, so hired again shortly after. All work completed to a high standard, very approachable, polite and friendly. If there isn’t a service you are looking for above, please contact us because I’m sure we can help out.